If you have a major season goal in front of you, a reasonable tapering protocol can supercharge your cycling performance. Even though this is not breaking news, many cyclists don’t benefit (enough) from tapering. In most cases people train hard and have a big training volume until one week before their season goal. After one week of reduced training volume, your performance will increase and you may believe that you’ve done everything right. However, if you’ve trained structured for months before a single prioritised race, you’ll probably benefit from a longer period of gradually reduced training volume. You have accumulated stress (progressive overload) that takes longer to recover from than just seven days. Actually, some riders can benefit from up to 4 weeks of tapering and still reach better performance levels. As you can see on the illustration, performance goes up for each week of tapering. And you’ll reach a higher level of performance than with only one week of recovery. Please don’t focus too much on the numbers, they are only to illustrate my points: Two weeks of tapering is most often better than just one week of tapering and adding another two weeks with slightly reduced training volume may further improve your performance. 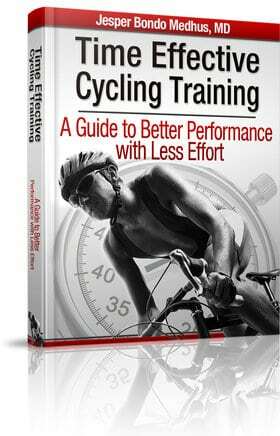 As I said: you can reduce training volume for a month without compromising your performance. Nevertheless, it’s important to remember that we are all different. What works for one athlete may not have the same effects on another. So if you already have a tapering protocol that works, there is no need to make significant changes. However, if you prefer to use only one week of recovery before major season goals, you may find inspiration in this article. Maybe you should try to add one week of extra tapering before your next important race. 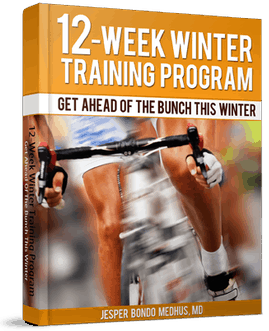 I have used the principles discussed above in my e-book ‘Time Effective Cycling Training’ where you’ll find a complete 16-week training program with a tapering protocol for a major season goal. In the next article, I’ll discuss some of the principles I recommend for interval training during tapering. Stay tuned!